Firstly, let me start by warning you, you're going to want to make these. So get prepared to buy some cocoa. I took 30 minutes to get the batter ready and left it to bake for 1 hour whilst meeting my girl friends for dinner. When we came back, the dessert was ready. This cake isn't the fluffiest cake you will ever eat, neither is it the prettiest classy girl in class. However, I assure you, you would want seconds and thirds, each a thicker slice than before. 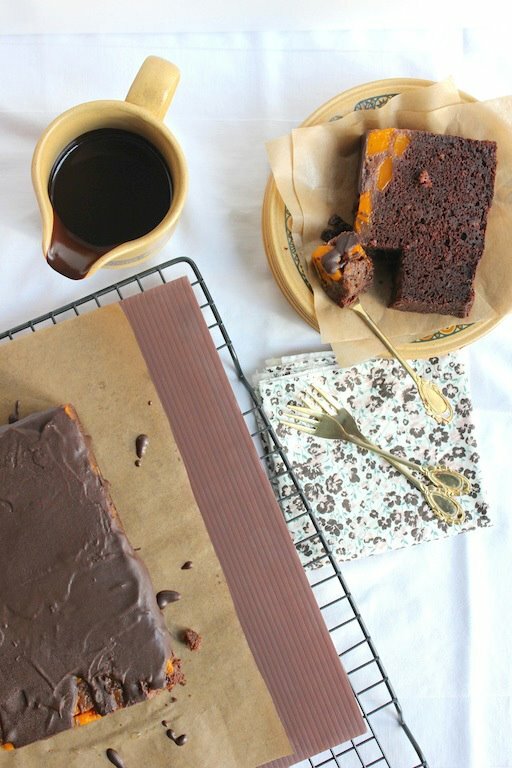 It's so very chocolatey yet not sickeningly sweet, perfectly moist yet not buttery, airy yet dense and with a simple addition of citrus/fruit, it's simply addictive. 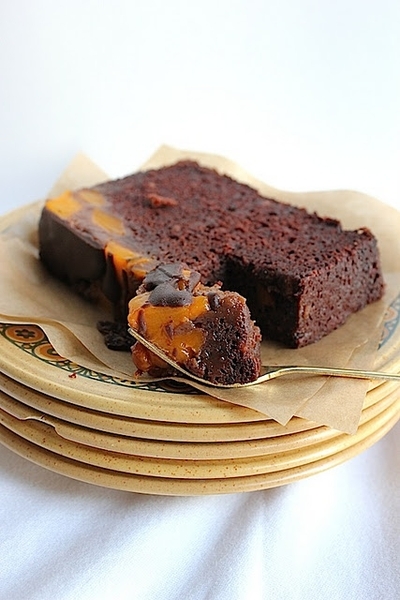 Mango Upside Down Moist Chocolate Cake! So you follow Jes' blog and you ask yourself, "ooh... mango? she said she hated mango cakes? Caught ya!" Let me explain. I love mangoes, as a fruit, especially these ones from my mother's hometown. These mangoes were from a village called Pasuruan in Indonesia. Even in the capital city, Jakarta, these mangoes are rare and much more expensive than other mangoes. This mango is called Mangga Harum Manis, translated to Fragrant Sweet Mango. They're so sweet and fragrant that it is difficult to cultivate (due to attracting insects). Hence, when an aunt of mine brought 10 of these mangoes to my arms, ripening at the same time, I had to come up with something. Whilst I would prefer to have them the way they are, it's almost impossible to consume all 10 within a few days. Hence, I decided to whip up a mango chocolate cake (chocolate because I love it) for the usual friday "gathering" with the girls. In conclusion, no you did not "catch me". In a large bowl, cream butter and sugar together until light and fluffy. Beat in eggs one at time, then stir in vanilla. Add the flour mixture alternately with the cocoa mixture. Pour batter into prepared pan (look below for the fruit addition steps). Bake in preheated oven for 50 to 60 minutes (depending on the pan you're using). Allow to cool before turning. Simple? Indeed. The batter you end up with should almost be wet and runny. Butter your pan, and sprinkle the fruit (in chunks) at the bottom of the pan. Remember to sprinkle the fruit, instead of placing one whole layer of fruit. This will make sure that the cake sticks to the fruit instead of separating into 2 different layers when you turn the pan over. As you pour the batter into the pan, remember to spoon batters into every part of the pan. Then pour the rest over the 1st surface. If you pour the batter in one spot, the fruit might lift up from the pan and the upside down cake will not have that layer of mango at the top. 1. Melt both above the double boiler and mix until completely melted. 2. Remove from double boiler and mix in additional chocolate bits to have that glossy effect. I love upside down cake - my mum used to make a lovely pineapple one, but anything with chocolate instantly gets my vote! Yours looks beautifully moist and sticky. Yum. What a perfectly colored cake for Halloween! My husband and his whole family are huge mango fans...I bet they would love this! Oh wow I've never tried mango and chocolate together! Sounds like something worth trying. Mmmm nothing like a moist chocolate cake! This looks really good..
@ Ingrid: Yes, it was new to me too! I would suggest adding mango essence to the cake but personally, i hate the smell of mango essence. @ Natashia: It is super moist. Especially when you heat it up right before taking your bite. I couldn't wait that long, so i just cut a slice and eat it straight. The richness of the cocoa offset by the sweet pieces of mango... I can imagine that would be really nice! This looks delicious and moist! @ Jo: Yes, we were all missing you :) I was shocked by how the photos turned out too... Daylight is really the best! How wonderful is this cake! I am a big fan of simple cake with packed flavours like this. Wow - that looks delicious! I'm a fan of mango and this cake looks so moist and delicious! You're right...I am going to want to make this! Thanks for a GREAT recipe! Hi.. Thanks for stopping by! Who is the friend who thinks Microwave is useless?!!! :D I'm shocked! @ Ann: YES! you, I was talking about! @ Kavi: Precisely! ohhh! we have more in common than anyone would think! I never would have thought to combine mango with chocolate. It looks so good! That mango…you captured it so well I can almost smell it! I never had mango and chocolate before. Seems like I’ve been missing out! Ps: thank you for visiting my blog and leaving a comment. It’s much appreciated. It looks like a wonderful combination of flavors. Delicious. @ El: that's what's make it fun! I'm obsessed with eating mangoes at the moment. Wish i could try the ones that you have used in your cake. Fab recipe Jesica. This is crazy creative! Love it. @ Lilla: Thank you! I love yours! I might have just started drooling while looking at these pictures... Mango is my absolute favorite fruit! @ goshthatssovegan: Thank you sweetie! Whoa this looks really good , I love the addition of the mangoes ,gotta try this one and your pics are really making me drool *slurp*. jes, this cake looks delectable. i LOVE the combination of chocolate and mangos! @ Jennifer: Thank you! You pecan chocolate is wonderful too! I'm so glad I found this via foodgawker...my sister is a huge chocolate fan and loves mango, too! I know she's never had them together and I can't wait to surprise her with this for her birthday!! Separate eggs before adding them to recipes–beat yolks till golden and creamy then add to the butter/sugar mixture. Beat the egg whites until light and frothy before folding them into the butter mixture.